Ho! Ho! Ho! Holla! Holla! Holla! It's DECEMBER!!!!!!! Now that November said PEACE OUT, my pants are a little tighter and the turkey's have gobbled their little hearts out…I'm now sitting here thinking WHOA…It's the last month of 2013!? UN-REAL. Instead of reflecting on all the things I didn't do this past year, I choose to celebrate the things I DID do. You should try it. Sure, we all wish we could have done more, been more, seen more, loved more, and accomplished more… but I refuse to look at it that way. I'll reflect more on these thoughts next month, but for now, I'm going to focus on the next 31 days of 2013, be IN the month of DECEMBER, be completely present, not think about January and REALLY make this month COUNT. I choose to be more in the moment. I choose to get ish done. I choose to slow down. I choose to love more. I choose to be still. Spend more time in prayer - Really work on my relationship with the Lord where I fail. 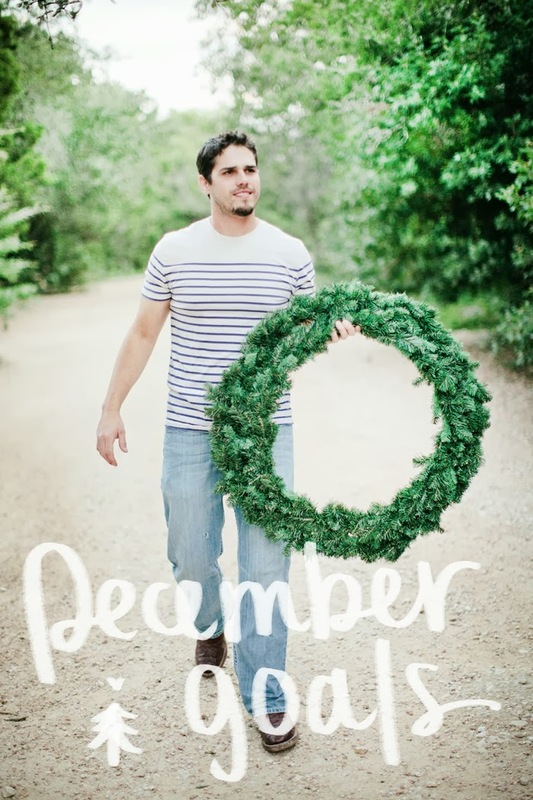 Here's to the home stretch friends and making December count. We got this. Prayers for my husband and I. You inspire me to write monthly goals. I used to be such a goal oriented gal and these past few months they've gotten away from me. Well NO MORE! I suspect I'll do a December Goals post on my blog now just so I can put my money where my mouth is! You are a rockstar!! I don't really have any December specific goals.. but I want to do 5 shoots before the end of the year. So far, it isn't going too well :-( But I've also have been passive marketing instead of being active. i save all addresses in my phone and then back them up to my computer. so much easier that way! You can do it! I loved reading your goals and I almost want to steal a few to add to my list ;) I also think this month it is so important but so hard to stay present in the moment and thankful for everything that's in front of us. I'm hoping to keep myself accountable to noticing each day's little gift by tagging them on instagram #delightinDecember. What better way than to celebrate the ultimate Gift than by giving Him praise all month long? FINALS! those are next week, and this week. Gotta pass all those mass comm classes! Happy Monday! I have seriously been waiting for Hattie's official introduction. Love your list girl. And the last item on your list had me laughing. Definitely smack that bum. Haha. I love your goals & I love you!! You did SO awesome in November though, seriously!! I have no doubt you'll knock out December too!! Muah!